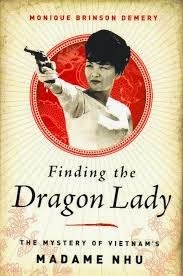 I finally finished Finding The Dragon Lady: The Mystery of Vietnam's Madame Nhu. Took me long enough, didn't it? That wasn't, however, for lack of interest. I've just been busy this last month. This book is written by Monique Brinson Demery, a woman with a fascination of Vietnam and especially Madame Nhu. One day Demery actually manages to strike up a friendship with Madame Nhu. This book was born from that friendship and, by the description of pulling information from Madame Nhu, it sounds like it went through plenty of its own labor pains. Former First Lady Madame Nhu went through so much scrutiny and betrayal during the down fall of her brother-in-law President Diem's regime she no longer trusted anyone. This coupled with a drive for attention lead to winding roads and power trips throughout the many interviews between Demery and Nhu. Madame Nhu was a selfish, proud, and arrogant woman who was utterly relatable. From the outside Madame Nhu could very easily seem as if she was simply a rich, self-promoting brat and much of the United States media of the time seemed to think that was exactly what she was. From the inside Madame Nhu seems like a deeply unsatisfied and repressed woman who, while extremely intelligent, often did not express herself well. Reading through the story of Madame Nhu's life my prevailing emotion was sympathy. Despite the fact that looking from the inside-out gives 'The Dragon Lady' a softer glow, she does have a hard, calculating side. As she famously said of the Buddhist monks' self-immolation, "Let them burn and we shall clap our hands.” And “if the Buddhists wish to have another barbecue, I will be glad to supply the gasoline and a match." These words were cruel, and intended to be so. Madame Nhu enjoyed shock, but also understood its value. In much of what she did there was a plan, an understanding of what was going on around her. Unfortunately for her and her family, there was a major disconnect between the way she expressed herself and the lower-class as well as one between her culture and that of the United States. Madame Nhu is a complicated character and not an overly trustworthy one. Demery does a good job of incorporating views of other people, including journalists of the time, and quite a bit of history. This helps balance out what would otherwise seem as a very one-sided book. Despite this, there are several times when Demery seems to take Madame Nhu's side without being objective. I think this compliments the book as it is a biography, not a history book, and is intended to read with a more story like lilt. These insights from Madame Nhu through Demery make you feel as if you are really getting to know the woman, whether you agree with her or not. Over all I felt this book was extremely educational. I was born soon enough after the Vietnam war for it to be a conscious part of my historical memory, but late enough after not to know very many details. This book filled in a lot of the gaps of what was happening leading up to the war while keeping my interest peaked the whole time. That being said, if you were truly interested in the era after reading this book, I think you would need to do a lot more reading before you would have a truly unbiased view. I really did enjoy reading Finding The Dragon Lady: The Mystery of Vietnam's Madame Nhu,but I felt a little let down at the end. The story came a nice, tidy close, so why did I feel so jilted? Looking back I think it was because the book ended when my kindle showed I was only 75% through. I looked through the rest of the book and the last 25% is made up of acknowledgements, references, and an index. These are great things and I'm not against including. I simply didn't realize it would take up that much of the book, I thought I had a lot more story left. Had I reached the end knowing the last quarter of the book was made up of those things, I would have found the ending perfectly satisfactory, so it isn't really something I can hold against the author. Perhaps if I had been reading a physical copy rather than my Kindle I would have found this out before the end. Ultimately, I definitely recommend reading this book. It has enough of a story feel and enough historical truth and depth to satisfy any reader. There is so much that could be said about this book, but I will simply end with saying it is worth it. Have you read Finding The Dragon Lady: The Mystery of Vietnam's Madame Nhu? If so, what was your opinion of it? If not, do you plan to in the future or does it not interest you? Tell me all about it in the comments!